Belkin ships a Miracast streaming dongle for your HDTV. So do Asus, GSI, Rockbirds, and Measy. 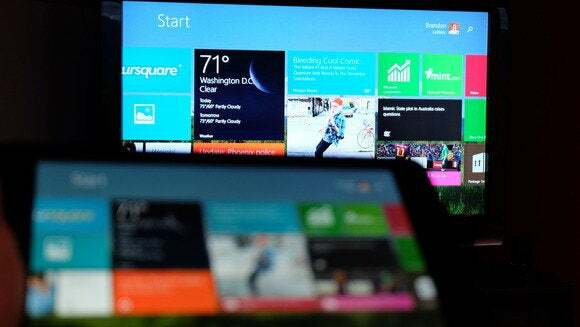 So why does Microsoft's new Miracast adapter matter? Because it's from Microsoft, and Microsoft needs another bridge between work and play. 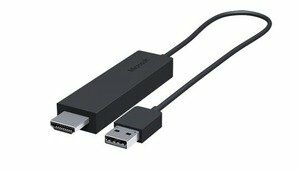 Microsoft debuted the Microsoft Wireless Display Adapter on Tuesday, a $60 dongle with two plugs: one for an HDMI connection on your PC or display, and the other a USB connection that supplies power. If you have a Miracast-enabled device, it will be able to connect wirelessly with the dongle and pass audio and video to the device. But the real difference is that Chromecast is designed for running mobile apps like Netflix on your TV. An ability to mirror your Chrome browser is more of an afterthought. Miracast was designed first and foremost to mirror what your screen displays, so it serves as a second, wireless monitor. (It also supports HDCP protected content, so you can "throw" a movie from your laptop to the dongle itself, playing the audio through the display's speakers.) That also means that while you can use it to wirelessly display YouTube videos, it can also be used to display a PowerPoint presentation, an Excel spreadsheet, or your PC's desktop. The focal point of the Microsoft office is still the personal computer, whether it be a desktop, notebook or tablet. Windows Phones take that office on the go. And in the living room, Microsoft hopes that you'll put your feet up with the Xbox One. But there's still a steep divide between a notebook PC, which is a productivity device, and the One, which Microsoft now insists is primarily for playing games. We're still looking for some device that will treat an HDTV as just another display, effortlessly switching back and forth between your cable television and your PC's desktop. Microsoft's wireless dongle isn't quite it. Still, Apple has its Apple TV, Google its Chromecast. Both are cheap, streaming-oriented devices. Microsoft doesn't seem inclined to directly compete with either of them. So its wireless dongle will have to do.